When coworkers are pregnant, I crochet. 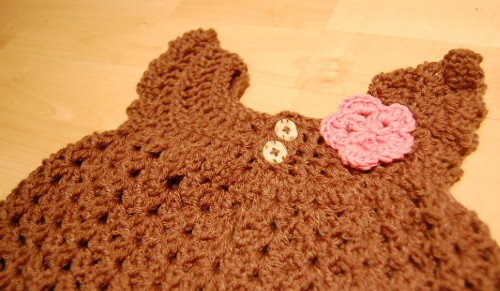 I found this beautiful crochet baby dress pattern from Bev’s Country Cottage (on Ravelry) and knew it’d be perfect for the soon-to-be little girl. 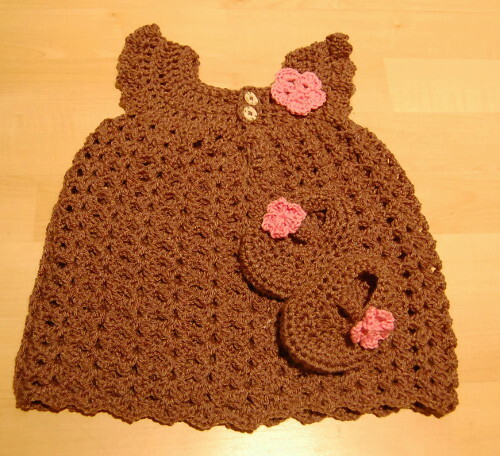 I used sport weight tan yarn and accented the dress with pink baby cashmerino flowers. The crochet baby shoes (Dainty Mary Janes from Ravelry) worked up in no time and they’re so tiny! Just look at how cute they are. I followed the dress pattern as written, but made it a few rows longer. I’m hoping it’s 0-3 months, though it might be larger. Not having a real baby handy, I’m unsure of the sizing. Hoping all this fits, but figured she can always grow into it. Also made a small little headband in the same pattern. I highly recommend the crochet baby dress and shoes patterns. They work up quickly and only use a little bit of yarn. If you’re looking for a last minute baby shower gift, whip up the booties, dress, or both and they’ll be sure to get plenty of “awwws”. The best news is both patterns are free. Enjoy!